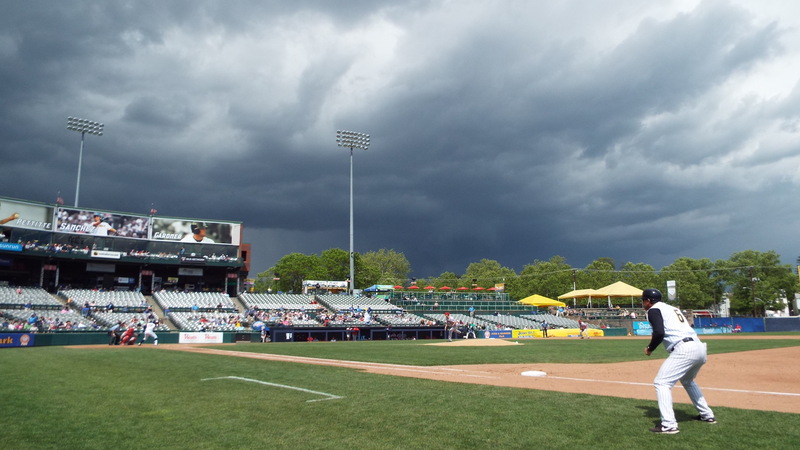 Arm & Hammer Park, Trenton, N.J. The only thing I can think of that’s better than going to the ballpark for a game is going for two. So last weekend, while Stacy was celebrating Mother’s Day with her family in South Carolina, I took advantage of the bachelor lifestyle in the best way I know how…watching live baseball. With my Mum deceased and my girl away, I pretty much had the day free. 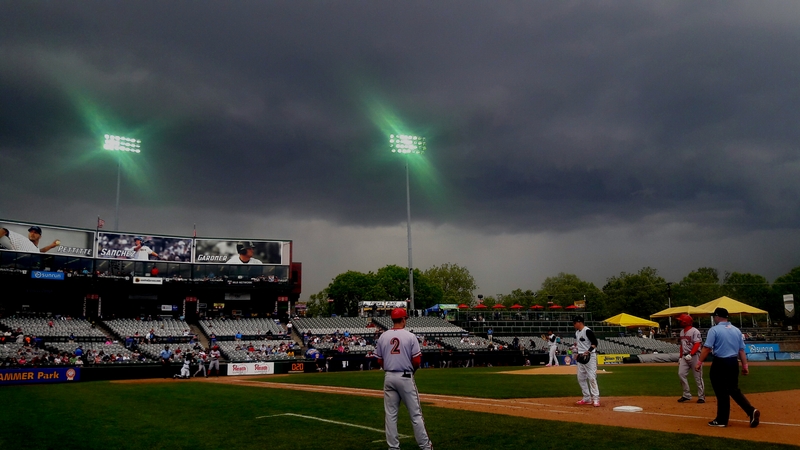 I took in a doubleheader at Arm & Hammer Park in Trenton to see the Yankees AA-Affiliate play the Nationals’ Harrisburg Senators. Section 103 on the first base side. Row AA. Seat 1. It was ideal. The Bronx Babies split with the junior Senators from Pennsylvania. 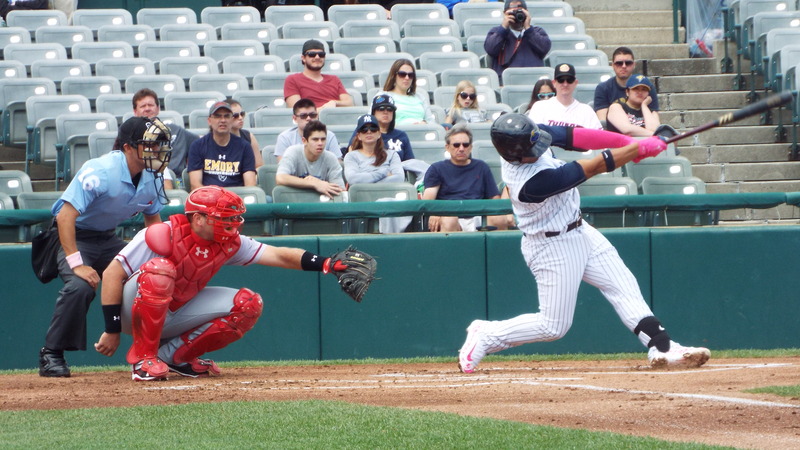 Gleyber Torres, considered by most to be the Yanks’ top minor league prospect, hit one out in game two. I even got a nice looking shot at the swing when he took Mr. Rawlings deep. I went full cliche and I loved every second of it. 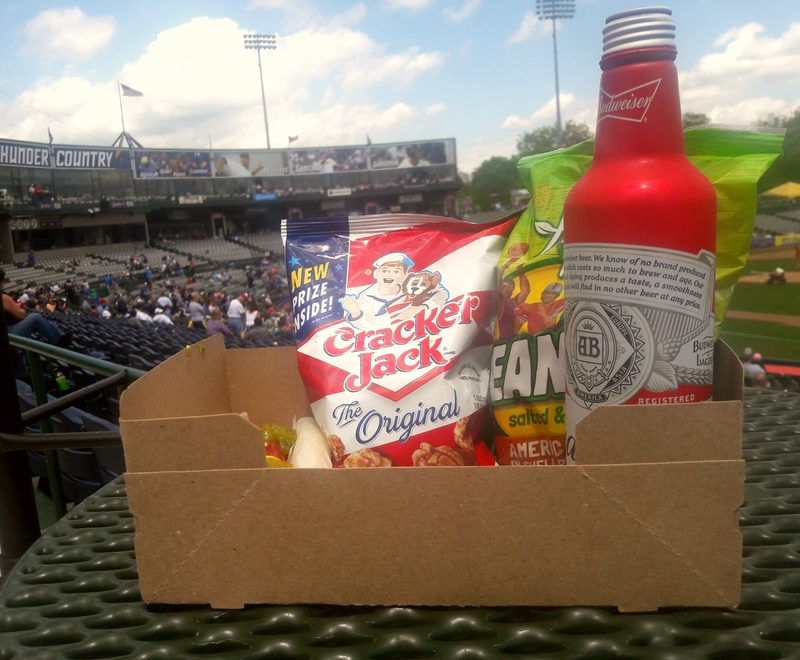 A hot dog and a beer during each game; in game two a bag of Cracker Jacks and Peanuts…although I didn’t really eat the peanuts yet. For most of the day the sun shone on the 3,500 of us and when the storm clouds rolled in during game two, most people left. They wanted to beat the rain. Candyasses. You don’t go to a ballgame to leave before it is over. If you’re going to do that, stay at home. No. I stayed. The rain came. For about seven minutes it came down relatively hard. I got soaked but the game continued. The sun returned, and some people had straggled back in. When the crowd left because of the rain I moved left to Seat 10 … the one that was the closest to the dugout and the field. I just don’t know a better place to sit than up close. No matter where you are. First base line, third base line, behind home plate or on top of the dugout. The closer you get to the field, the better the game. You may remember I told you back in April how going to Oriole Park at Camden Yards was so wonderful and how the baseball bug has bitten me. Seeing the Thunder has gotten me even more excited about going to games. So much so, that two days after the Trenton game I went to see the Somerset Patriots. I even took a selfie with Sparkee. Next up? I go to see the Thunder again on Tuesday June 26. The following week or so I will be in Charleston, S.C. where I will see the River Dogs (the Yankees A-Affiliate) play the Columbia Fireflies….as of this writing the left fielder for the Fireflies is Tim Tebow. Yes. THAT Tim Tebow. I got me, Stace and her parents tickets on the left field side, front row. Hopefully he won’t get called up to AA-ball before the Friday July 7 game. We also have tickets for the July 12 Atlantic League All Star Game at TD Bank Ball Park – home of the Somerset Patriots. Man, I do love this game. Pictures from all three games below. Okay, well, uh… candlesticks always make a nice gift, and uh, maybe you could find out where she’s registered and maybe a place-setting or maybe a silverware pattern. Okay, let’s get two! Go get ’em.